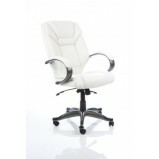 Soft bonded leather seat, back and outer Unique stitch detail and contemporary design Gun metal grey arms Black cantilever frame Options Black, brown or ivory bonded leather Matching Executive version also availa.. 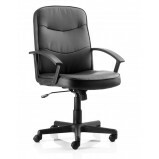 Stylish high back executive armchairs Leather padded arms Gun metal grey base and arms Two lever lock any position mechanism Gas lift with weight tensioner Options Available in black, brown or white bonded leathe..
Glacier Reception Arm TC have created a flexible modular family, perfect for any reception. 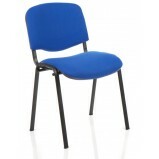 With additional arms and table, this range truly caters for all your needs. 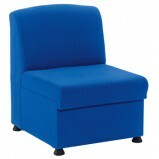 Stocked in royal blue, charcoal or claret, it brightens any reception..
Glacier Reception Chair TC have created a flexible modular family, perfect for any reception. 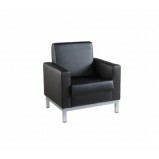 With additional arms and table, this range truly caters for all your needs. 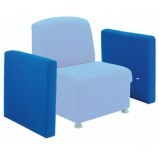 Stocked in royal blue, charcoal or claret, it brightens any recepti..
Glacier Reception Table TC have created a flexible modular family, perfect for any reception. 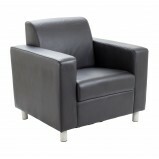 With additional arms and table, this range truly caters for all your needs. 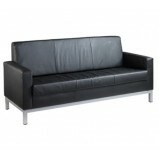 Stocked in royal blue, charcoal or claret, it brightens any recepti..
Soft blackleather Distinctive line styling Options Matching executive version available ..
Soft blackleather Simple clean lines Gas lift tested up to 150kg Options Matching vistiors version also available ..
Bonded leather upholstery Polyurethane padded arms Strong cantilever chrome frame Stylish one piece frame design ..
Two seater reception chair Epoxy coated square section steel frame in silver Large box arms Options Single seat 3 seater available ..
Two seat reception chair Epoxy coated square section steel frame in silver Large box arms Options Single seat & 3 seater available ..
Large single seat reception chair Epoxy coated square section steel frame in silver Large box arms Options 2 seat 3 seater available .. 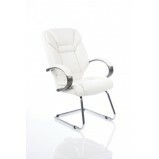 Iceberg ArmchairIceberg is a traditional armchair and sofa suitable for reception or breakout areas, and is available from stock in black leather facings.FeaturesA modern black leather-faced armchair with silver metal feetDeep cushions and .. 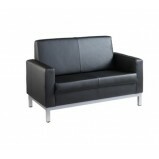 Iceberg Reception SofaIceberg is a traditional armchair and sofa suitable for reception or breakout areas, and is available from stock in black leather facings.FeaturesA modern black leather-faced 2 seat sofa with silver metal feetDeep cush..
ISO Stacking Chair Black Frame These stackable chairs are practical and comfortable. 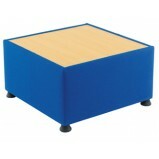 Stack away for absolute space-saving solutions. 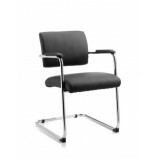 Ideal for the boardroom, the meeting room, the seminar, public waiting areas, canteens and schools. 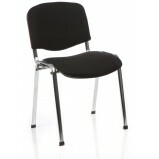 Thes..
ISO Stacking Chair Chrome Frame These stackable chairs are practical and comfortable. Stacks away for absolute space-saving solutions. 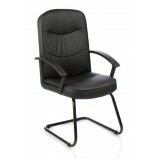 Ideal for the boardroom, the meeting room, the seminar, public waiting areas, canteens and school..